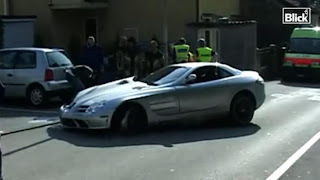 According to MotorAuthority, last week saw Italian socialite, Roberto Parli crash his McLaren SLR supercar in Switzerland. While the accident is still being analysed, Parli is thought to have side-swiped an oncoming car on a Swiss motorway, causing the vehicle to lose its right front wheel. He allegedly continued to drive, hitting another car and losing its left front wheel. Parli is a determined man, and apparently attempted to continue his journey but was finally stopped by other motorists in addition to an engine fire. Once departing the vehicle, Parli apparently shouted: "I'm a millionaire, I'll pay for everything I don't care," at the scene. 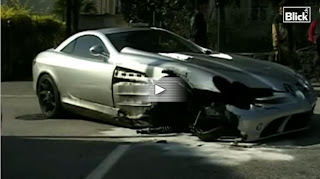 Millionaire or not, we doubt Parli's car insurance firm will payout any money.